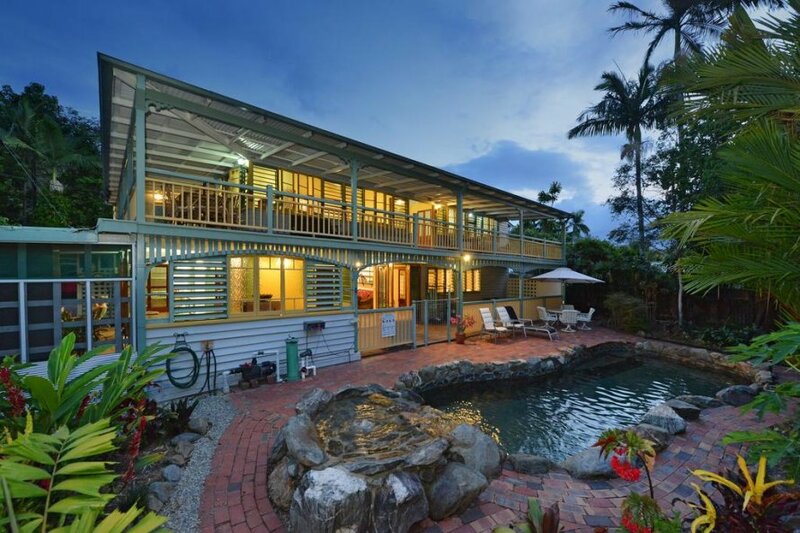 Cairns Bed-and-Breakfast accommodation doesnt get any better than Lilybank. Situated in the leafy suburb of Stratford, this 6-bedroom, 2-storey historic house offers privacy, comfort, convenience and the chance to live like a local. 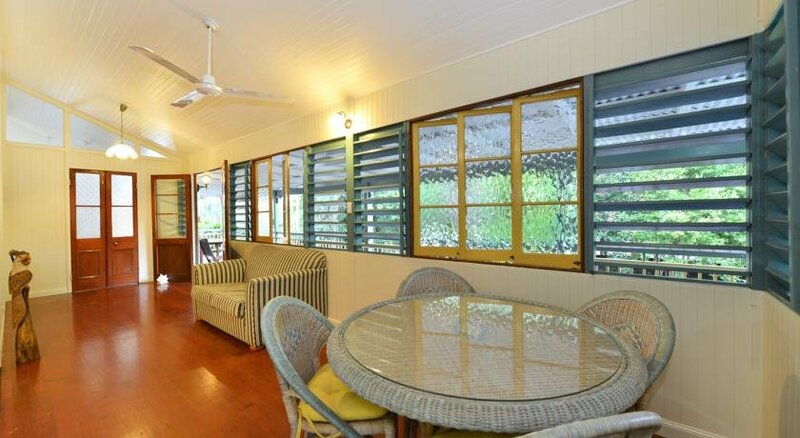 Set in a stately, timber, Queenslander-style property, Lilybank Bed-and-Breakfast has provided a tropical sanctuary to its residents in one form or another for nearly 100 years. Retaining the charm of yesterday with original lead lighting and casement windows, the property was refurbished and furnished in October 2013 to provide the best of modern comfort, including all new beds, linen, air-conditioning, WIFI and a resort-style swimming pool. This room is more of a mini-apartment, combining a separate bedroom, living area and private ensuite with toilet and shower. Its perfect for couples and guests who enjoy a bit of extra space and may like to entertain visitors. Located on the northern end of the property, Room 1 has polished timber floors on its enclosed verandah which features tables, chairs and cane lounges. The carpeted bedroom can be completely closed off and has a King Bed with side tables and built in cupboards and drawers. The bathroom is tiled. Theres split system air-conditioning, a bar fridge and private television, with a combination of casement style windows and louvers. Located on the western side of the property, furthest from the entrance and road, Room 2 is twin share with two comfortable King Singles. The light and airy room has high ceilings and fan as well as a split system air-conditioner. Tastefully appointed with bedside tables, bar fridge, television and a free-standing wardrobe, the carpeted bedroom has doors which open on to the exterior balcony with views over the back garden and rainforest-covered mountains beyond. Room 2 has a separate private ensuite featuring toilet, shower and bath with a generous vanity unit. Guests are welcome to enjoy the adjacent communal lounge room, with comfortable cane lounges and large-screen television. Positioned in the heart of the house, Room 3 is a combination of modern-style apartment layout and traditional Queenslander-style features, including high ceilings and tongue-and-groove walls. Accessed off the upstairs communal lounge room, Room 3 is tastefully furnished with a Queen-sized bed, matching bedside tables, bar fridge and private television. Its private ensuite is concealed with a sliding door. This light and airy room is carpeted for your comfort and has doors which open on to the exterior timber balcony, offering views over the back garden and rainforest-covered mountains beyond. Room 3 has a split-system air-conditioner and ceiling fan for guest comfort and convenience. This large and spacious bedroom is located at the rear of the property, with double doors opening on to the paved outdoor verandah. Tiled throughout, Room 4 has high ceilings and white tongue-and-groove walls which maximise the sense of space and light. Tastefully appointed with a comfortable Queen-sized bed, bedside tables, bar fridge and private television, Room 4 has a large private ensuite with free standing shower and sink. Room 3 is a comfortable retreat for guests and features a split-system air-conditioner and ceiling fan for comfort. Located on the ground floor, this room offers convenient access to Lilybanks communal kitchen, alfresco dining area and swimming pool. Room 5 is positioned at the back of Lilybank Bed-and-Breakfast with double doors opening on to the outdoor courtyard and adjacent tropical gardens. 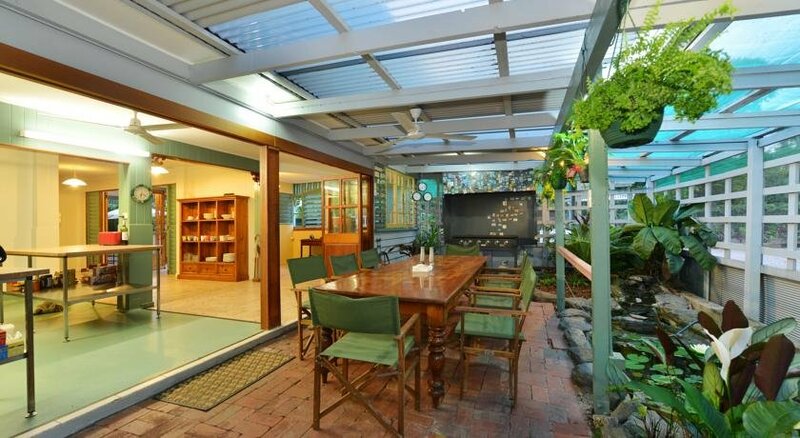 Tiled throughout, this room is a cool retreat featuring stunning Silky Oak timber features. The luxurious Queen-sized bed is made with 400 thread count, fine cotton sheets and has hypoallergenic pillows. The room features a ceiling fan, split-system air-conditioning, bar fridge and private television. The ensuite has a separate bath and shower. Occupying the south-eastern corner of Lilybank Bed-and-Breakfast, Room 6 is large and spacious with plenty of glass louvers to maximise natural light and tropical ambience. Room 6 is tiled throughout and tastefully appointed with a luxurious King-sized Bed, bedside tables, cane furniture, bar fridge and private television. The room has doors leading inside and out, providing convenient access to the communal living and kitchen area, as well as outdoor courtyard, tropical gardens and swimming pool. The large private ensuite has a free standing shower and sink. Like all bedrooms at Lilybank Bed-and-Breakfast, Room 6 has a ceiling fan and split-system air-conditioning.